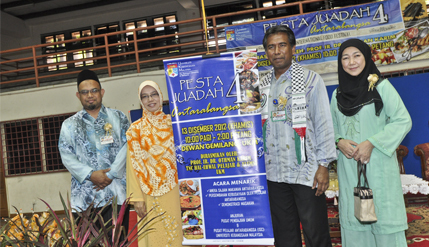 BANGI, 13 Dec 2012 – The fourth International Food Festivalof The National University of Malaysia (UKM) which showcases a range of international dishes received overwhelming support today with some running out of their food in just a short time. 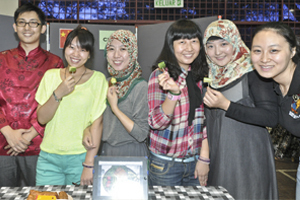 International students of the university were invited to prepare and serve delicacies of their respective countries for the festival held at the Dewan Gemilang in its campus here today. It was launched by Deputy Vice-Chancellor (Student Affairs and Alumni), Prof Ir Dr Othman A. Karim who praised the international students for their hard work to prepare theircountries’ delicacies for friends and visitors. Also present were Director of the Centre for General Studies, Prof Dr Khairul Anwar Mastor; Director of the Centre for International Students, Assoc Prof Marlyna Maros and Director of the International Food Festival programme, Assoc Prof Dr Fazilah Idris. The countries taking part were Iran, Iraq, Brunei Darussalam, China, Jordan, Bukina Farso, Oman, Saudi Arabia, India, Afghanistan, Libya, Bangladesh, Sri Lanka and Indonesia.The Festival is aimed at fostering closer ties between the local and foreign students of the university. 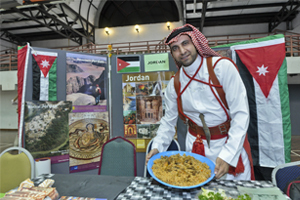 One of the participants eager to promote the cuisine of his country, Jordan, was Abdullah ibni Muhammad, 24, who said the festival is ideal for a cosmopolitan university like UKM. He and his wife helped prepare traditional cakes, while their compatriots cooked Lamb Pulo Rice. 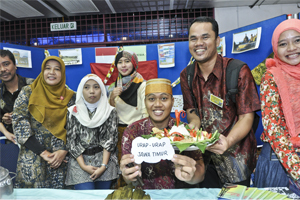 The Food Festival helped foreign students introduce their traditional food of various kinds and flavors and at the same time allowed them to demonstrate the preparation of their cuisine. They were also given the opportunity to relate various places of interest in their contries to visitors. Various activities were held throughout the exhibition including cooking shows, briefings on each nation and traditional dances, singing and poetry readings.